Is Your Rolex Looking Boring? One of the great aspects with Rolex is their timeless design and trademark bracelet and with owning a Rolex, there is really no need to get another watch, expect for when you are tired of how it looks. Rather than feeling guilty, there are plenty of methods for changing the look of your watch without thinking of having to flip your Rolex. The least expensive and probably the most utilitarian strap are the NATO straps. NATO straps are made of nylon cloth and are designed such that the strap is continuous and not two-pieces like traditional watch straps. The thinking behind a NATO strap is that in the event of a springbar failure, the watch is still secured by the other springbar. With traditional two-piece watch straps, if a springbar breaks the watch falls off, similar to a broken bracelet clasp. NATO straps are available in a variety of thicknesses, colors and quality levels. NATO straps are known for their comfort, light weight, and pliability. NATO straps can withstand water, and are easy to clean. The only drawback to a NATO strap is that the nylon does appear to weather after a while, and sometimes the nylon begin to fray. When the NATO strap looks worn and weathered, they are easy and inexpensive to replace. For Rolex sport watches, another option is to replace the Oyster bracelet with a specially designed silicon rubber strap replacement by RubberB or Everest Straps. Both the RubberB and the Everest Strap are designed specifically for Rolex out of high quality silicon rubber that is vulcanized. Unlike other replacement rubber straps found on eBay, these straps are hand crafted and designed to fit Rolex sport watches exclusively. The advantages of a silicon rubber strap are that they are light, they do not capture dirt, grime, and sweat like the Oyster straps, and they have a little give/stretch in them that makes them very comfortable to wear. 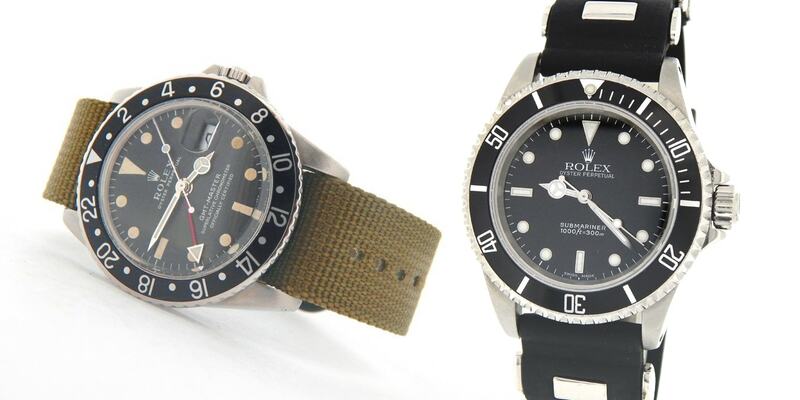 Both the RubberB and the Everest strap use the Oyster clasp from the Rolex bracelet to keep as much of the Rolex look as possible. Unlike the NATO straps, the Everest and RubberB strap are designed to last for many years and require no real service or care.